New Way Lunch is a family-owned restaurant in Glens Falls, NY, famous for their delicious hot dogs. They were looking for ways to get more exposure for their business and contacted Mannix Marketing for a social media marketing program. 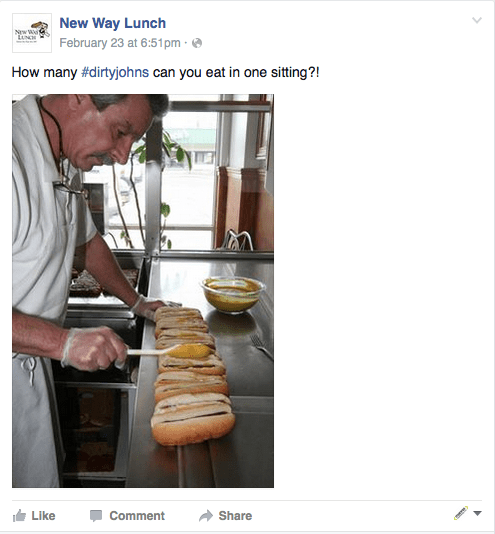 During the course of this 2-month Facebook marketing program, we helped New Way Lunch grow their Facebook likes from 1,456 to 2,742! The posts received a significant amount of likes, shares, and comments. Here’s an example of one that reached over 12,953 people, received 697 likes and garnered 138 shares. New Way Lunch also received a flood of great reviews along with mentions from people interested in visiting the restaurant. In addition to posting on their Facebook page and running a selfie contest, we managed and responded to a number of private Facebook messages and reviews.